One of the first things that I took on in my Shuttleworth open philanthropy gig was to help the team develop a ‘theory of change‘. The aim was two-fold: create a simple compass to guide internal decisions and develop a tool to help the rest of the world understand what we’re up to. Basically, we wanted a snapshot of how our collective brain works as a team. Well, that was 18 months ago. We’ve had at least two all staffs, a dozen small group chats and countless online conversations since. And we’ve produced many iterations, at least one of which I have blogged about here. Not surprising. That’s how strategic planning-y things often go, especially when they are intentionally open ended like this one. What is surprising was how useful all of this conversation has been in aligning our everyday thinking. Words that we didn’t have before — words we invented for the theory of change — have become a part of everyday thinking and decision making in the office. And, things we’ve believed in for a long time, like transparency and open licensing, have actually become a more real part of our work. Which, in the end, was probably the point. The aim was to simplify as much as possible, just showing the essence. Also, there are lots of changes to some of the core language we are using. In the near future, our designer Eugene Badenhorst will soon take a shot at making the above diagram real pretty and then doing a small booklet based on the slides. In the meantime, I highly encourage you to start adding thoughts into the mix, especially if you work closely with the Shuttleworth Foundation. Are we on the right track? If we aren’t, what’s missing? If we are, how close is our theory to our practice? Where do we need to work harder? Where are we full of it? The idea is that this snapshot of our collective brain will continue to evolve, even after the pretty design. Getting feedback — good and bad — from people who work with us is a critical part of this. Leave comments here, or send mail to Steve Song (the new lead on this), Helen and I. If you’ve been following this blog, you’ll know that one of my Shuttleworth open philanthropy experiments was the ‘How We Work‘ club. This is basically a quarterly pizza lunch where the whole organization reflects on an important aspect of how we function as a foundation (e.g. making sure everything is under an open license). The conversations focus on what’s working, what’s not and how things could be better. I then write up a blog posting and an article so that the rest of the world can learn from the discussion. This week’s pie noshing chat focused on a highly recursive topic: how is the How We Work club working? Somewhat surprisingly to me, the answer was a unanimous ‘it’s working well’ … or, at least, ‘it’s quite useful’. The first thing that people seem to appreciate is checking our rhetoric against reality. Our discussions on open licensing are a case in point. We’d been saying ‘we’re doing a better job on open licensing’ for while. Sitting down to talk about it underlined the fact that we actually hadn’t finished or published our new Open Resources Policy. And, putting a deadline on writing up an article forced us to actually get the policy done (or, at least, for me to harangue Karen and Andrew constantly :)). The result was that we actually delivered what we said we’d been doing: offering a clear open licensing policy that the world could see and our partners could review. Talking through the open licensing policy also surfaced the fact that we didn’t have consensus on which licenses to promote (share-alike) and who should own intellectual property (external partners or the foundation). An hour of forceful conversation went a long way to showing where the differences were, and helping us construct some common ground. As a result, we ended up with clearer language on license flexibility (share alike is the default, but arguments can be made for slightly more or less open licenses). Also, we created room for different options around IP stewardship (the draft policy had the foundation owning everything). These were important changes that both improved the policy and made sure we had a document that was more widely supported by the team. The other thing that people appreciate is the opportunity to think through ‘how we work now’ against the backdrop of mistakes we’ve made in the past. Strategy at the Shuttleworth Foundation definitely has a heavy dose of emergence. Which is a nice way to say: we’re willing to make mistakes and then hack things to make them better response. The licensing policy emerged at least in part from problems with our laissez faire ‘just use an open license’ approach. Similarly, the fellowship program grew from frustration with having to invent a ‘project’ to fund for every smart person we wanted to work with. Looking back at the things that shaped current practices has helped us all get on the page about ‘why we are who we are’. Hopefully, it will also result in useful lessons for other small foundations. Of course, there are some things that are broken about the How We Work process. For example, all of the writing sits with one person (me). Different people have different expertise and passions. It’s likely we’d get better material if the person who cares most about a topic were to write it up. Also, there is a fair bit of brokenness in our follow up and promotion process. We did nothing to get the Open Resources Policy article out there other than putting it up on our site. We need to flog stuff like this more widely. Despite the fact that I’m heading off into the open philanthropy sunset, the How We Work club will continue, albeit under a new name: Notes From a Small Foundation. There is a general feeling that this is more about ‘what we’re learning’ than simply ‘how we work’. The new name reflects that. Karien will be leading the charge on this new version, with different people facilitating and writing up a session every couple of months. Upcoming topics include ‘IRC, wikis and internal communications’ (Steve S) and ‘project exit strategies’ (Helen). It’ll be fun (and a bit sad) to watch this next chapter unfold from afar. 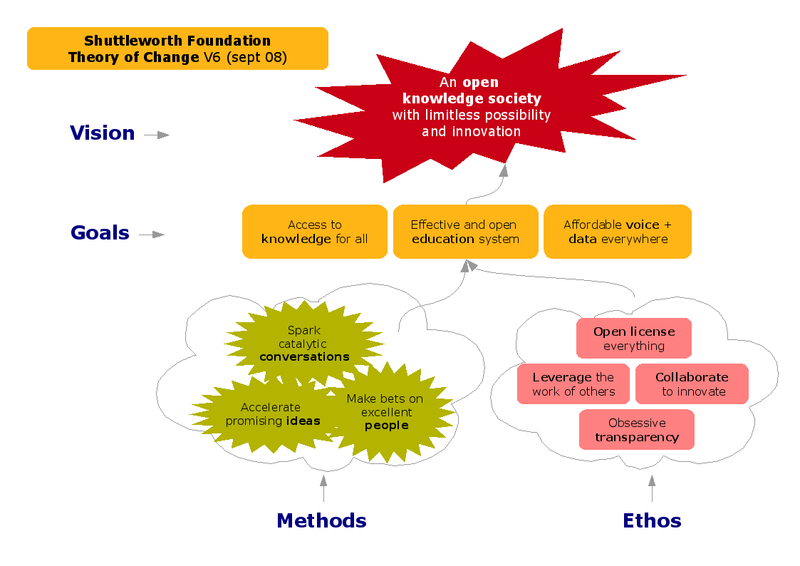 A few months back, I posted a draft How We Work article on the Shuttleworth Foundation‘s open licensing strategy. The basic idea is that we want everything we do and fund to be under an open license. As my article says, this hasn’t always worked as we haven’t had a clear policy on the matter. Good news: now we do. resources is owned and licensed. standards and in open formats, free of technical protection measures. This will now flow into an update of our standard grant and consulting contracts, and generally guide us as we go forward. Great work, Andrew and Karen! With the release of this policy, we’ve also finalized and polished my article on the topic of open licensing. It’s up on the Foundation site in both HTML and PDF. Last month, we sat down to have another How We Work conversation at Shuttleworth Foundation. Under the microscope this time: our Fellowships Program. We’re all pretty happy with this program. So, the aim was to reflect on why it seems to be working … and to find ways to tweak and improve it. The fellowships idea has a simple genesis: the desire to work with people on the front edge of issues like open education, knowledge and telecom in a way that is at once agile and high impact. Projects and grants sometimes work for this. However, they just as often create a situation where the Foundation is talking to the right people (smart, connected and engaged on the issues that matter to us) in the wrong way (long project negotiations trying to fit round pegs into square holes). The fellowships emerged about 18 months ago so we have a way to make bets not just on projects but also on people. We currently have four fellows. Andrew Rens working on access to knowledge and intellectual property. Steve Song on open telecom. Steve Vosloo on communications and analysis (aka ‘how education needs to work differently in the 21st century’). And myself with the dual hat of open philanthropy and open education. With the exception of myself, all the fellows work in our Cape Town office alongside the people who manage our grant making and in-house projects. 1. The ‘make bets on smart people’ works for us. The fellowships are based on the ‘make bets on smart people and let them run’ model. This approach has bought the Foundation two things: agility (we can move quickly on ideas and issues) and intellectual momentum (I can’t think of a better term … but basically we are moving as a group on the issues that matter to us). Also, we’ve created a brainstormy hothouse in the office, with ideas bouncing about constantly. This not only has the fellows fueling each other but also feeds projects like Siyavula and Kusasa and the organization as a whole. While it’s still early days, we’re starting to get traction on specific work led by the fellows. Steve Song has gathered people around the beautifully disruptive idea of the village telco. Andrew has helped South Africa drive the openness agenda in the OOXML / ISO discussions. Steve Vosloo is helping to shape the conversation on mother tongue instruction, which is a critical issue in the future of South African education. I helped a group of open education pioneers birth the Cape Town Declaration. These are small scale results, for sure. But are concrete and, more importantly, they represent the kind of things we want to see happening in the world. 3. … but follow through is sometimes tough. On the flip side, we haven’t always had perfect follow through on this early traction. If I just look at the Cape Town Declaration, we could have done more to quickly seize the momentum we built with the Declaration launch in January. This could have been fixed in part by me blogging, engaging and pushing more post launch. The fellowships are all about this kind of ‘just roll up your sleeves’ action. However, our not perfect Cape Town follow through is also related to the fact that we’ve tried to organize some of our next step activities using grants (watch soon for Open Education News) … which is a slower way to get things rolling. We need to think about how we elegantly combine grants and fellowship energy in the future. We have an opportunity to move further faster combining these things, but we aren’t there yet. 4. Getting the word out is even tougher. We’ve also had a tough time sharing and communicating the ideas emerging from the fellows. All of the fellows are blogging, some in high profile places. This is good. There is a blog aggregator. Which is also helpful, although it’s not clear who follows it. What’s needed now is a better web site that pushes people to this material more aggressively. MOre importantly, we need a better strategy for getting people engaged: more thoughtful links between our e-mail newsletter and our most compelling posts; blogging about other people’s work, especially the Foundation’s partners; getting other bloggers to link to what we’re writing. Small, simple stuff. We need to do it. 5. Paper, podiums and parties are great … but needs discipline. The tongue-in-cheek mandate for the fellows program is ‘papers, podiums and parties’. Papers = writing and blogging to push thought leadership. Podiums = speaking and evangelizing. Parties = running events and building networks. Tongue-in-cheek or not, this trio actually serves well as a way to check whether we’re working on the right things. A quick reflection at the meeting showed that most of us are doing well in one or two areas, but not necessarily in all. Eg. Steve Vosloo’s work on mother tongue has a great paper and he’s spoken on podiums … but we need to follow through with some sort of symposium on the topic (a party). We need to be a bit more disciplined about tracking what we are doing in these areas and filling in the gaps. The bullets above are a gut reflection on the meeting MP3 and my notes, which I just went over last week. I will write a more formal How We Work article on fellowships sometime in July. If you have questions or would like me to dig deeper on any particular points, please post comments here. During my recent trip to Cape Town, the Foundation held a 'messaging meeting'. This is basically a communications group therapy session. Everyone has two or three minutes to deliver a pitch on their work and projects. After watching a video playback of each pitch, the group offers constructive criticism. The 'get better at your pitch' benefits of this exercise are obvious … and doing a session like this every few months is worthwhile for this reason alone. However, there was a bigger and somewhat surprising benefit: team building. People learned about each other's projects in a way that they would never have time for during the normally flurry of a workday. They also had a chance to provide informal, rapid-fire input on both the positioning and substance of the work we are doing as a Foundation. And, fueled by the nervous gawkiness of any public speaking rehearsal, all of this was rolled up inside a good dose of humour and love. It was quite amazing. I hope I get to do it again. that is exactly what we have built. growing, and it is real. subtle but quite powerful ways. from outside, which is not very hot-house-y. Fixing this is critical. page a of our site. Much more is in the works. that it's about to produce a great deal more. PS. While I love the hothouse metaphor, I am still not completely convinced we should use it for the updated theory of change. Comments on this highly encouraged. You are currently browsing the philanthropy category at commonspace.